Dr. Ravindra Kumar is a Former Vice-Chancellor of CCS University, Meerut, India. ALSO HE HAS BEEN A CONSULTANT TO UN UNIVERSITY OF PEACE FOR GANDHIAN STUDIES. Although the orthodox supporters of untouchability may have read the earthquake in a different light than Gandhi's, they were at least interpreting it at the same level. But Rabindranath Tagore challenged the very level at which Mahatma Gandhi was interpreting the event. If for Mahatma Gandhi the earthquake was a natural phenomenon which nonetheless had a moral cause underlying it, for Rabindranath Tagore it was a natural phenomenon which could only have been caused by natural causes. This debate on the point between Mahatma Gandhi and Rabindranath Tagore has been understood as a debate between moral and natural causation. And to a certain extent, it was perhaps just that. When it is viewed purely in these terms, a vital point is overlooked, namely, that it is a debate not between rationality and irrationality but a debate between rationality and faith. Or, in Aristotelian terms. the debate is around the final cause. In order to appreciate this point, a central argument which has been developed in terms of modern theism needs to be clearly recognised: that if God really wished from human beings to turn to him in uncovered faith that he would confront us with precisely the world we possess, in which we cannot decide on the basis of available evidence whether an act is an act of nature or of God. The point has been made with exceptional clarity by John H. Hick in recent times. Mahatma Gandhi was fully aware of this dilemma of faith, without which faith would not be faith. He concludes his chapter dealing with the illness of his son who he thinks was saved by God's intervention. 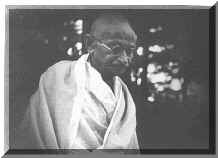 Hence the earthquake will have to be open to both the explanations if Gandhi's interpretation is to be an act of faith.